With gourds the possibilities are almost endless. So, where does one begin? First, get inspired. Spend time with your gourd. Try to discover its unique personality. Examine the gourd from every angle. Does its shape remind you of anything? Does it have a particularly pleasing pattern? Most gourds will tell you exactly what they want to be! Use your imagination. 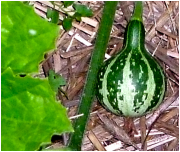 Gourds can be fashioned into almost anything. Some ideas include bowls, vases, birdhouses, ornaments, masks, sculpture, jewelry and musical instruments. Do what interests you! For beginners, it's best to start with a simple design. Once you are comfortable working with gourds using various techniques move on to more intricate designs. ​Determine the materials and techniques you will be using to decorate your gourd. Start by asking yourself a few simple questions. Do you want your gourd to be functional, decorative or both? Is your gourd intended for indoor or outdoor use? Will your gourd come in contact with food? Answering these questions will help you decide which materials are best suited for your project. Remember, most decorating materials are not food safe. If your gourd will come in contact with food it must be decorated and sealed with special, food-safe products. Speaking of flops, my wood-burning pen got away from me once completely ruining the design on a beautiful bottle gourd. I was about to throw it away when Jason stopped me. "Keep working," he encouraged. "You can fix that." I was certain I was wasting precious time and materials but I tried to incorporate my whoops into a new design. When my flop was finished it wasn't as bad as I expected but I still didn't like it. All I could see was my mistake sticking out like a sore thumb. Imagine my surprise when that gourd was picked from a pile of "masterpieces" to become the very first gourd I ever sold. My flop was somebody else's favorite! ​1. Don't be afraid to make mistakes. Your gourd may be offering up creative suggestions. 2. Never give up. If you make a mistake, do your best to repair the damage. Someone will appreciate your efforts. 3. Gourds have flaws & blemishes just like people. Embrace the flaws and incorporate them into your grand design! Craft tips or life lessons? You decide. Either way, you're bound to create something beautiful.